Artist Statement: My work deals with the examination of impressions relating to my cultural identity and the essential structure of my experiences. As an Italian-American woman, I have had a constant flux of influences and images coursing through the body of my artwork. The daughter of Sicilian immigrants, my daily existence was (and is) colored by an exposure to very specific cultural and religious icons. Many of my images are related to my family’s religious beliefs, sense of humor and extreme superstition. My aesthetic as a visual artist has been formed, in part, by seeing prayer cards of saints and angels, small plastic statues of major Italian monuments, stories told about my family’s history, and very typical Sicilian icons. All of these elements, although very different in form, meaning, and function, were comfortably juxtaposed in my household, against patterned wallpaper, golden fixtures, and brocaded fabrics. I recognize how important story telling is to establishing my sense of self within the communities to which I belong (family, academic, political and artistic). I have also observed, during my education and training as an artist, that I am specifically drawn to the art and techniques of printmaking, specifically color reduction woodcuts. Briefly, a woodcut is the earliest printmaking technique. My images are drawn on planks of Baltic birch plywood, and are hand carved. The raised parts of the block are inked with a brayer, and then a sheet of paper is placed over the block and printed by running it through a printing press. Reduction printing describes the process of using one block to print several layers of color on one print. What initially appealed to me about prints was their graphic quality. As I continue to study prints, I learn that they are historically a venue for storytelling, a way for many people to receive a message. Given the democratic tradition of graphic images and my need to shape narratives pictures, creating prints is both the necessary, and logical, medium in which to communicate my visual ideas. Speaker Bio: Since her arrival at the University of Texas at Arlington, Nancy Palmeri has received several international honors for her prints. She received a fellowship, to work at the Frans Masereel Graphic Arts Center in Kasterlee, Belgium. Palmeri was also awarded a Bogliasco Foundation Fellowship to live and work in Genoa, Italy. She has presented at the Southern Graphics Council Conference numerous times. Professor Palmeri has lectured and demonstrated her printmaking techniques at colleges and universities, nationally, including: Washington University, St. Louis, Pratt Institute of Art, New York, Louisiana State University, Baton Rouge, LA, Cornell University, Ithaca, NY and Boston University, Boston, MA. Palmeri has had solo exhibitions of her work in New York, Boston, Louisiana, Texas, Italy, Chicago, and Virginia. Recently, her prints were included in Color Print USA, Lubbock, TX, and Global Matrix International Print Exhibition, Perdue University Art Gallery and the Frans Masereel Graphic Art Center’s Jubilee Exhibition, Belgium. 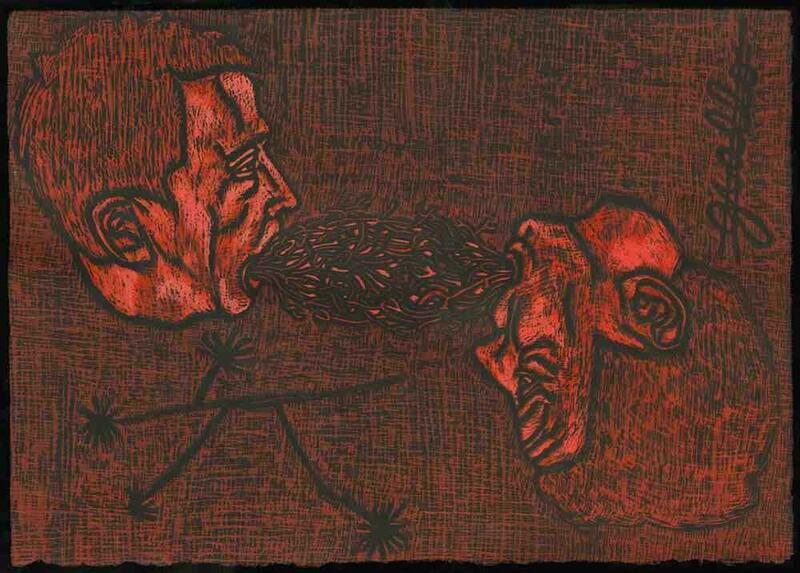 She has also curated three exhibitions at the Gallery on the campus of the University of Texas at Arlington, Anthropology in Print, Pervasive Impressions: Contemporary Political Prints, and Foundations: Mechanics and Instinct. Nancy Palmeri has lectured at the International Humanities Conference, Cambridge, UK. Recently, her work was featured in Printmakers Today, published by Shiffer LTD and in Artist Modern, an international art magazine published in Istanbul Turkey. Palmeri’s prints are in the collections of the Fogg Art Museum, Harvard University Art Museums, The Royal Museum of Fine Art, Antwerp, Belgium, The Sheldon Memorial Art Gallery, Lincoln, NE, The Santa Barbara Museum of Art, CA, The Hunterdon Art Center, Clinton, NY, the Musem of Texas Tech University the Instituto per la Cultura e l’arte, Catania, Italy, the UCLA Grunwald Center for Graphic Arts, The University of Miami, and the Tama Art University in Tokyo, Japan.